A tasty trio of bacon treasures. 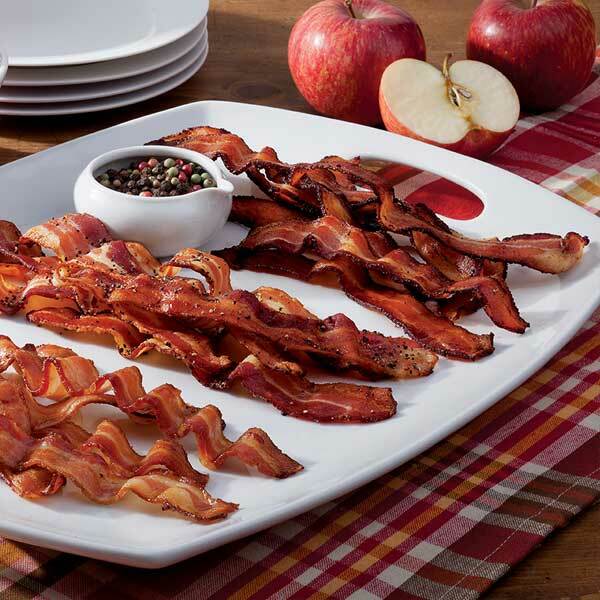 Sample each of the most popular bacon varieties and see if you have a favorite. Start with the classic sliced Hickory-Smoked Country Bacon. Move on to Smoked Peppered Bacon, spiced with a coating of fresh, cracked black peppercorns. And lastly, the sweet and savory combo of dry-cured Maple Bacon. This sampler will make you and your fellow bacon lovers rejoice! NOTE: Because this bacon is produced in a separate facility from ours, which burned in the January 2016 fire, returning customers may experience a slightly different flavor profile than what they're used to with these products. However, we still honor our 100% Satisfaction Guarantee. Thank you for your consideration as the recovery process continues. Ingredients: salt, sugar, pepper, sodium nitrite. Storage:Refrigerate upon arrival. If not to be used within 28 days, freeze for up to 6 months. Preparation: If slab bacon, slice to thickness you prefer. Cooking is required.